The Buffum Total Learning Center (TLC) received tender loving care as nearly 100 volunteers from the school and Kaiser Permanente spent a recent day sprucing up the campus. The nonprofit Sharefest organization partnered with the school on the project. Buffum serves preschoolers who have special needs. The Sharefest Workday is an annual community-building and service day that mobilizes volunteers of all ages to work on community projects designed to meet tangible needs. Sharefest is an organization that bridges the gap between individuals, companies and organizations that want to provide supplies and volunteers to schools and churches. 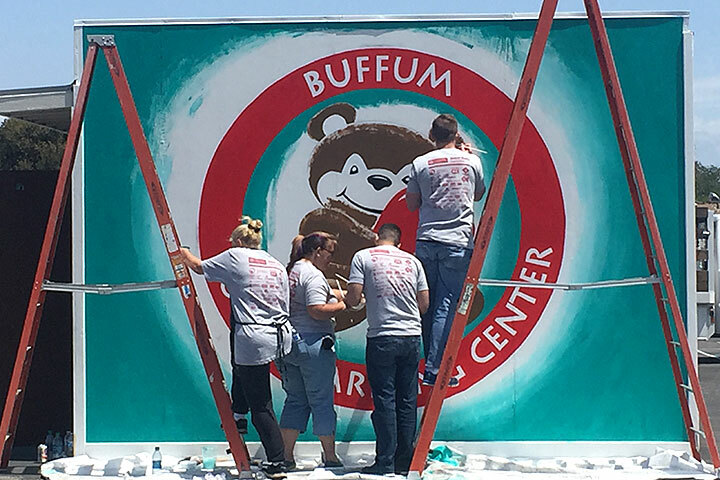 TLC – Volunteers paint a new mural on a playground shed at the Buffum.